africrops! cooperates with Kolping for a new moringa project in Tanzania - africrops! Thanks to our expertise in the field of moringa cultivation, africrops! was approached by Kolping Germany with a request to conduct a feasibility study on moringa cultivation in Tanzania. In recent years, the Kolping Vocational Training Institute in Hettstedt (Germany) has developed a caffeinated soft drink with moringa and baobab among the ingredients. In order to obtain high quality moringa in the long term, a joint project with Kolping Tanzania was initiated to set up a moringa farm in Tanzania. Kolping comprises a worldwide network of about 400,000 members in more than 60 countries. According to their own statements, Kolping members actively promote a socially just change in society. 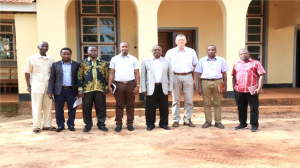 The project in Tanzania comprises a number of objectives, including the development of moringa farmland and a so-called Center of Excellence. The center includes all basic steps in the production of moringa powder, such as harvesting, drying and grinding the moringa leaves. In addition, it will also serve as a training center where members of the Kolping family are trained in moringa cultivation, harvesting and processing. To ensure the sustainability of such a center by local trainers, the project includes a “training of trainers” programme. The project is a typical example of the work of africrops! : our unique approach does not only focus on the purchase of raw materials, but also entails the active participation in setting up local production chains in Africa.